მიუხედავად იმისა, რომ ENIAC-ს პირველად მხოლოდ საარტილერიო სროლების გამოსათვლელად შეერთებული შტატების ბალისტიკური კვლევის ლაბორატორია იყენებდა, ის ასევე შეიცავდა თერმოდინამიკური იარაღის შესწავლის პროგრამებს . 1946 წლის 15 თებერვალს, ENIAC გადაეცა პენსილვანიის უნივერსიტეტს, გაზეთებში მას „გიგანტურ ტვინს“ უწოდებდნენ. ის ათასჯერ (103) სწრაფად მუშაობდა ვიდრე მანამდელი ელექტრომექანიკური მოწყობილობები. Oral history interview with S. Reid Warren, ჩარლზ ბებიჯის ინსტიტუტი, University of Minnesota. Warren served as supervisor of the EDVAC project; central to his discussion are J. Presper Eckert and John Mauchly and their disagreements with administrators over patent rights; discusses John von Neumann's 1945 draft report on the EDVAC, and its lack of proper acknowledgment of all the EDVAC contributors. Gumbrecht, Jamie. “Rediscovering WWII's 'computers'“, CNN.com, 8 February 2011. წაკითხვის თარიღი: 9 February 2011. ↑ John Presper Eckert Jr. and John W. Mauchly, Electronic Numerical Integrator and Computer, United States Patent Office, US Patent 3,120,606, filed 26 June 1947, issued 4 February 1964; invalidated 19 October 1973 after court ruling on Honeywell v. Sperry Rand. ↑ Weik, Martin H.. "The ENIAC Story". O R D N A N C E (708 Mills Building - Washington, DC: American Ordnance Association) (January–February 1961). http://ftp.arl.mil/~mike/comphist/eniac-story.html. წაკითხვის თარიღი: 29 March 2015. ↑ Shurkin, Joel (1996). Engines of the mind : the evolution of the computer from mainframes to microprocessors. New York: Norton. ISBN 0-393-31471-5. ↑ Moye, William T. (January 1996) ENIAC: The Army-Sponsored Revolution. US Army Research Laboratory. წაკითხვის თარიღი: 29 March 2015. 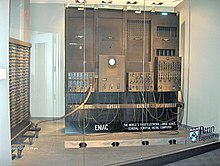 ↑ Scott McCartney p.103 (1999): "ENIAC correctly showed that Teller's scheme would not work, but the results led Teller and Ulam to come up with another design together." ეს გვერდი ბოლოს დარედაქტირდა: 09:01, 15 თებერვალი 2017.